Seaward Development is planning an 18-story, 25-unit luxury condominium project at 605 S. Gulfstream Ave., currently the site of the Versailles residences. Another high-rise condominium building is in development near Sarasota’s bayfront. On Tuesday, Seaward Development filed a preliminary application for an 18-story, 25-unit condo at 605 S. Gulfstream Ave. The property is currently home to the Versailles, a mid-rise condo building constructed in 1974. Seaward Principal Patrick DiPinto said the group has spent more than a year planning to develop the Gulfstream site. Although that planning process is still ongoing, DiPinto said the average unit will be 4,000 square feet with four bedrooms. At $1,100 per square foot, that puts the price for the average unit at more than $4 million. The units will be targeted at people who want to relocate to the city but don’t want to significantly downsize from a single-family residence. “We see this site as an alternative for our island and high-end consumers who have large homes and want the convenience of condominium living,” DiPinto said. Seaward spent more than $9 million to buy out the 14 owners at the Versailles, according to Sarasota County Property Appraiser records. The developer believes sustained demand for luxury condominiums near the water will make that expenditure a worthy investment. DiPinto said his team has already heard from prospective buyers. DiPinto said the development would comply with the city’s existing zoning regulations, which means it will go through city staff for review and approval. Seaward hopes to begin construction in the fourth quarter of 2018, which could put completion of the project in late 2020. Residents on Gulfstream and Palm Avenue have recently expressed concern about the effects of construction in the area — particularly the 624 Palm high-rise condo development, located right next to the Versailles. DiPinto said Seaward has already engaged in conversations with neighboring property owners and city staff, and pledged to prioritize safety during the construction process. “We’re trying to be cognizant of what’s important to our neighbors,” DiPinto said. The project does not yet have a name, and sales are set to begin in March. Already, though, the developer is setting lofty expectations for the final product. Another 18-story luxury condominium is coming to the bayfront, a sign of continued interest in high-end downtown residences. Patrick DiPinto said deciding to build a high-rise condominium at 605 S. Gulfstream Ave. was an easy choice. That’s why DiPinto’s company, Seaward Development, spent more than $9 million to buy out the 14 owners of the Versailles condo, built in 1974 on the Gulfstream site. And on Jan. 16, Seaward filed a preliminary application to knock down the existing structure and build an 18-story, 25-unit condo in its place. Buying a condo building only to demolish it and build a new one is a costly endeavor. DiPinto said the units, which will average 4,000 square feet with four bedrooms, are marketed toward island residents who don’t want to significantly downsize from a single-family home. The units won’t go on the market until March, though construction likely won’t begin until the end of the year. And yet, Seaward said it already has seen significant interest from buyers. “We have had dozens of Realtors call us with prospects who want to be downtown,” DiPinto said. Since 2013, developers have moved forward with a series of 18-story downtown structures near the bayfront. That’s the maximum height allowed for buildings in Sarasota, permitted only on properties zoned downtown bayfront. Starting with The Jewel at 1301 Main St., at least eight projects in the past five years have included plans for 18-story buildings. The Quay development likely will have multiple high-rise structures. Two more properties zoned for 18 stories — one at Fruitville Road and U.S. 41, the other at 838 N. Tamiami Trail — lack formal plans but are slated for development in the near future. Some residents have groused about the recent influx of high-rise buildings, but Sarasota officials say the city is being developed according to plan. If residents or city commissioners wanted to see a different type of development, Cover said the city does have the means to change its regulations governing new building. But that doesn’t mean the city can suddenly halt all high-rise projects. In Florida, if property rights have been given to somebody, they can’t be taken away without compensating for the lost value. That means, for example, it could allow increased residential density in exchange for reduced height. Or, to address other issues, it could go in the other direction — in exchange for mandating wider setbacks from the property lines, the city could allow taller buildings. Cover, who moved to Sarasota in 2017, has taken note of the focus on luxury residential development near downtown. From a planning perspective, he said that’s not a point of concern — merely a reflection of the demand for that particular product. Gulfstream Avenue resident Lottie Varano is more wary of the continued development downtown. Varano lives in the Essex House, where residents have raised a series of complaints about the effects of the neighboring 624 Palm construction site. Because of those complaints, the city is reconsidering its regulations on setbacks for downtown buildings, though no changes have been made. Although the Essex House won’t be as directly affected by the Versailles redevelopment, Varano encouraged the builder to take concrete steps to address the safety concerns associated with new construction. 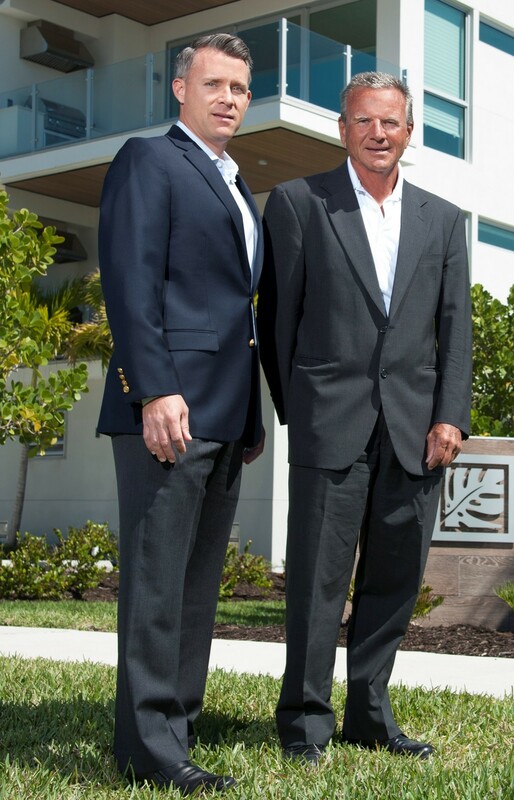 Patick DiPinto and David Hargreaves of Seaward Development are moving forward with two different high-end luxury condominium projects on Gulfstream and Palm avenues. DiPinto said Seaward has already spoken with neighboring property owners and city staff, and pledged to prioritize safety during the construction process. And though the project doesn’t even have a formal name yet, the developer is setting lofty expectations for the final product. Varano said he recognizes the city can’t pick and choose which high-rise developments to permit, but he wished the city had a mechanism that would slow the rate at which new buildings are going up. Across the street from the Essex House, Seaward has broken ground on another residential project — the five-story, 16-unit 7 One One Palm condo at 711 S. Palm Ave. The safety issues are residents’ most pressing concern, but Varano said the constant construction creates a quality of life issue, too. DiPinto said the 605 S. Gulfstream project could be complete by late 2020. Taken together with the 624 Palm development, that’s five years of high-rise construction in one piece of the city. Varano acknowledged that’s the reality of life in a growing city. Still, he said he was disappointed downtown residents seemed fated to keep dealing with the nuisances of life around construction sites.